“I don’t think I’m either analog nor digital,” Kame says. “Well, what kind of an Eririn are you then?,” Gaki-san asks. Kame says that she is in fact beyond both. “I’m actually quite advanced!” While analog has the image of being something old, even digital now seems old to Kame! Fan mail #2: This message is from a girl who just entered high school two years prior. And yet, they already have a problem they’re dealing with… a love problem, to be specific. Or so they think: they’re actually not quite sure if it really is love or not. (Kame: “I can’t! I can’t read this any further! This is too sad!” Gaki-san: “Why? Just read it!” Kame: “I feel like I’m about to cry! Gaki-san, are you okay?” Gaki-san: “I’m fine.” Kame: “Oh, okay then.“) Apparently, the listener and the boy in question haven’t even exchanged email addresses or anything — it’s just that she’s so drawn to his lovely smile. Yet, she’s unsure if this really is what people mean by “love.” Thus, her question to the hosts — her “seniors in life” — is: what kind of a feeling is it exactly when people say they’re “in love“? Noting how this message makes one’s heart throb, Gaki-san offers that, although the listener says she isn’t quite sure if she’s in love, simply the fact that she’s even asking this question could be proof that she is. Kame says she’s already convinced, and the the hosts both agree: this has got to be love. So with that out of the way, they say that the listener’s only option now is to figure out if she wants to become something more with this boy, or if she wants to just be friends. They ask her to email the show immediately in case there are any updates in regards to her situation. Kame (in a deep voice): Yes. Gaki-san: (laughs) That’s so shameless. Kame (in a high-strung tone): Yeesssss!!! There’s no one out there who hates money, the hosts agree. “I’d pick up a 1-yen coin if I saw one on the ground,” Kame says. Fan mail #4: The listener says they’re an avid reader of Gaki-san’s blog and they wish to ask: is it OK if they continue calling her by the name of “Rii-ko” in the comment section? Gaki-san: This person is saying they’re choosing to listen to the show even though they need to use the toilet! Kame: Our listeners are the best! Kame: While I don’t think it’s good to hold back from going to the toilet… I really do wish our listeners do their best to hold it anyway! Gaki-san: (laughs) Well, yeah. Just for these 30 minutes! Fan mail #6: The listener says they have some big news to share. “Lately, young people seem to be calling Oronamin C by the name of “Oro-C.” They were recently made fun of by some younger people for not knowing this, and they thus wonder if they’ve simply fallen behind the times. 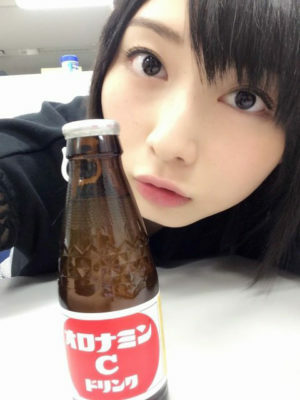 The hosts have never heard of anyone calling the drink “Oro-C,” and this makes them feel quite shocked: if “Oro-C” is currently used by younger people, this must make the hosts simply old. Gaki-san and perhaps Kame especially take offense to this. 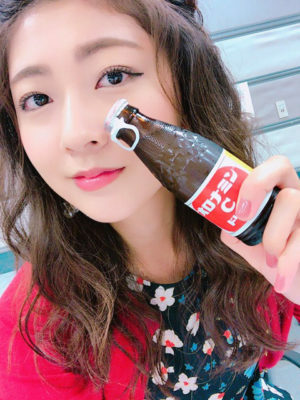 Seeing as members of Morning Musume will quite often be drinking Oronamin C before concerts and such, they both swear they’re going to try using the word “Oro-C” more from now on. Fan mail #7: On Morning Musume’s 2010 Spring tour, the members appear on stage wearing various animal costumes. The listener wants to know if there are any other animals the hosts would like to try. So far, the animal costumes featured have included cows, leopards and rabbits. While the cow and leopard ones were quite cool with the hoods and all, the rabbit ones felt embarrassing to both hosts. “They were like… SO Sayumin,” Gaki-san feels. And indeed: Sayu was saying she wanted to sing every song on the tour wearing the rabbit outfits. As for trying out other animal costumes? Gaki-san recommends a monkey outfit for Kame, which Kame protests. Kame unsurprisingly wants to try out a turtle outfit, so she suggests a Mame (bean) outfit for her co-host. Gaki-san points out that a bean is not an animal. Gaki-san: We’re waiting for your messages! Go ahead and ask us anything, such as “how much French does Kame know?” Anything goes! Kame: … I, too, am going to use the toilet now.